Ultrasonic transduction - experimental and modelling. Ultrasonic measurements of material properties. Non-contact ultrasound, particularly EMATs and laser-based ultrasound. Eddy current and electromagnetic methods for NDE. Thermographic methods, particularly laser spot thermography. Steve Dixon is the Director of the Centre for Industrial Ultrasonics (CIU) and a Member of the EPSRC funded Research Centre for NDE. 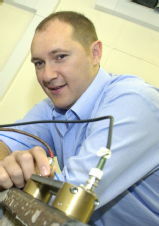 He currently holds an EPSRC Research Fellowship and a Royal Society Industry Fellowship. He has previously served as the Editor-in-Chief of Nondestructive Testing and Evaluation and Chair of the Technical Committee for the British Institute of Non-Destructive Testing. He has served on other committees including the IOP Physical Acoustic Group, the IOM Steel Committee and the IOM Steel Instrumentation Committee. He is currently on the editorial boards of Insight and NDT&E International is a Warwick Ventures Enterprise Champion and is a Director of spin-out companies Sonemat Ltd and Eddysense Ltd.